This is what happens when I go shopping lately.. This is what happens when I went to the drug store today.. I just start swatching every pretty polish I see! Most are Essence, Catrice and Etos.. I ended up not buying any of these because they were either too pink instead of red, similar to a polish I already have, or too sheer. 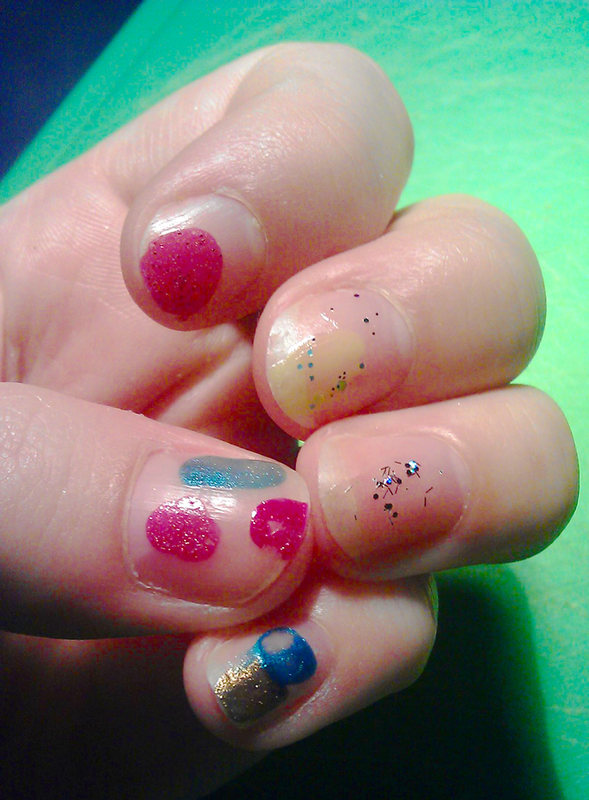 I might go back to buying the glitter/feathery polish on my ring finger. It also had large diamond-shaped glitters, but mine fell off. Definitely needs a top coat! I also kind of liked the yellow/green on my middle finger, but it’s quite sheer on its own. What do you think? Should I buy any of these polishes, or got any recommendations in general?